(SUNY, April 2017) xiii + 178 pp. Reviewed by Alastair Hunt on 2017-10-19. Not too long ago, the director of graduate studies in my department, seeking to fine-tune an exam given to students in our master's program, asked me what one concept best defines Romanticism. I didn't need long to give her an answer reflective of dominant scholarly opinion. The best candidate, I said, is probably "the self." After reading this book, however, I'm seriously considering changing my answer. Perhaps the concept that best sums up Romanticism is "life." No doubt, an awareness of the Romantics' deep investment in the concept of life has informed scholarship for some time. In 1971, almost fifty years ago, M.H. Abrams declared that "[t]he ground-concept [of Romanticism] is life" (Natural Supernaturalism 431). More recently, this claim has been re-affirmed by dozens of studies such as Denise Gigante's Life: Organic Form and Romanticism (2009) and Ross Wilson's The Meaning of 'Life' in Romantic Poetry and Poetry (2009)). Like their contemporaries in the life sciences, we have learned, Romantic writers energetically described and speculated about the nature of life. Indeed, they often made "vitalism" and "organicism"--the very characteristics of life that Abrams singled out--key elements of their theory and practice of literature. Broglio's account of Romanticism's deep investment in the concept of "life" does not contradict the arguments made by such studies. But it nonetheless provides a fresh perspective on their topic. If the Romantics found new significance in life, he argues, it is not merely because life served as a useful model for aesthetic phenomena. It is rather because the Romantics participated in an emergent struggle over the political meaning of "life." Romanticism's investment in life, that is, belongs to historical developments in which life itself becomes the core of politics. That the very life of living beings is the object of political techniques in modernity is the defining proposition of theories of "biopolitics" or "biopower." First decisively articulated by Michel Foucault, Broglio explains, this proposition has since been refined and extended by a number of other scholars. The easiest way to explain it is to say that in modernity, power assumes a new right. Besides the traditional sovereign right to put individuals to death, it assumes the right to "make live," as Foucault says. That is, without ever completely relinquishing the right to kill, modern power also arrogates to itself the right to produce, cultivate, regulate, and control life itself. For both good and ill, then, politics has taken possession of life. Whether biological, affective, or private, whether individual or populous, life has moved to the center of politics in the modern age. Broglio's appropriation of biopower as a theoretical resource for examining Romanticism is not as improbable as it might seem to some scholars. According to Foucault's chronology, biopower emerged in the west during the late eighteenth and early nineteenth centuries. In other words, the genesis of biopower coincided with the literary historical period known as Romanticism. And a number of scholars have, in fact, already linked Romanticism and biopolitics. Both Robert Mitchell's Experimental Life: Vitalism in Romantic Science and Literature (2013) and Sara Guyer's Reading with John Clare: Biopoetics, Sovereignty, Romanticism (2015) compellingly demonstrate how the concept of biopolitics can not only shed new light on familiar romantic texts, but also reveal things about Romanticism that have hitherto remained unobserved. Broglio's analysis of biopower in the Romantic period, however, differs from those of Mitchell and Guyer in several significant ways--as a brief summary of his argument shows. The six chapters of this book are divided into two halves. The first three chapters (after an introductory chapter) examine the multi-pronged address that biopower directed at both farm laborers and "livestock" during the Romantic period. In chapter two, for instance, Broglio explains that the poor British harvests of 1795 led economists to consider how best to manage the agricultural market; in so doing, he argues, they tried to conceive of human beings in Britain as a population of living beings rather than as a citizenry. But Broglio equally stresses that these efforts of biopolitical control were met by forms of mass resistance such as "gleaning," the farm laborers' practice of gathering from harvests the unbundled remainders. Turning in chapter three to the poet-farmers Robert Bloomfield and Thomas Batchelor, Broglio links the killing of animals with the vulnerability of farm laborers whose lives were radically upended by the modernization of agriculture. But the life-world of traditional farming had power of its own. Chapter four argues that the supernatural forces in James Hogg's fairy tales figuratively show how this world resisted the project of agricultural improvement, which subjected the interests of both farm laborers and farm animals to the profit-motives of large-farm owners. In the second half of the book, agricultural workers and domesticated animals give way to natural historians and wild animals. In chapters five and six, moreover, the objects examined are paintings and engravings rather than literary and social scientific writings. In chapter five, Broglio explains how illustrations of animals by Thomas Bewick and George Stubbs variously encode in their formal dimensions a particular difficulty: the challenge of fully capturing the forces of bodily life by the taxonomy of natural science. In chapter six likewise, Edwin Landseer's paintings of wild animals and hunting scenes are said to be haunted by an unnerving acknowledgement of the inhuman, even "antihuman," indifference of nonhuman nature to human desires and intentions. Turning back from pictures to texts, specifically to contemporary posthumanist theory and canonical Romantic poetry, the final chapter (also called, oddly, the afterword) re-affirms the Romantic fascination with nonhuman life: with a radically material nature independent of the subject, biopower, and the human. Though my brief summary inevitably glosses over many fascinating details, I hope it is clear that in Broglio's argument, "life" in the age of Romanticism and biopower is not only human. Of course the living beings targeted by biopower during the Romantic period include human beings--particulary farm laborers--but as Broglio points out, they are joined by a variety of animals, especially agricultural animals such as sheep. This point is notably innovative. Normally, biopolitical studies such as those of Mitchell and Guyer assume that power's address to life does not comprehend the living in general outside the human species--that is, outside the overwhelming majority of living creatures on the planet. But building upon Cary Wolfe's Before the Law: Humans and Other Animals in a Biopolitical Frame (2012), Broglio argues that animals are exemplary targets of biopower, assumes that all living creatures can be addressed by mechanisms of power, and examines this address in all its variety. Clearly, his book makes a timely contribution to the Romantic subfield of animal studies that was inaugurated by David Perkins's Romanticism and Animal Rights (2004). But in wisely framing his study within the biopolitical paradigm, Broglio makes an insightful point too often missing from animal studies: the same techniques of power distribute life and death to both human beings and animals. 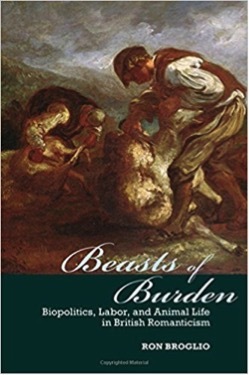 As Broglio puts it, biopower makes "beasts of burden" of both farm animals and farm laborers--the two principal referents of his title. A related and equally provocative insight offered here is that modern agriculture ranks among the major historical developments central to the rise of biopower and, by implication, Romanticism. Studies of biopower do not often examine the production of food as a manifestation of biopower. And while Romanticists often note the "enclosure" of common land, this book defines it as just one element in a massive industrialization of agricultural production that was heating up in the mid-eighteenth century. A major point of this book, then, is that Romantic poetry and prose bear witness to the transformation of human beings and animals alike. Both become a population of living creatures with basic needs to be managed through tracking of such phenomena as birth rates, food intake, bodily health, docility, and mortality rates. Nevertheless, this book prompts one large question: was the process of politicizing life in all its forms as agonistic as Broglio claims? Though he is surely right to show how power's attempts to regulate and administer life were resisted, one wonders if he accurately describes the contest. Most often he treats life's response to power as a matter of "resistance" or "excess." For instance, citing one of Edmund Burke's infamous phrases, Broglio says that "the 'swinish multitude' serves as a figure for life in excess of population" (19). In her study of biopower as reflected in the poetry of Clare, Guyer also points to an "excess" that biopower fails to "contain" (4). For her, however, the excess is produced by the very techniques of biopower themselves, and it can be described rhetorically as unfolding from a disjunction between their announced content and their performance. By contrast, Broglio conceives of the excess that meets biopower as something that emerges out of life itself. Indeed, he even refers to life itself as a power: "the biological power of life (biopower) (18) or "the power of life to exert itself" (20). In treating life as already there. waiting to respond to power's encroachments on it, Broglio underestimates the productive nature of power, its ability not just to manipulate life but to make it. He also overestimates the extent and significance of the resistance to biopolitics, especially in ending the book with a straight-up celebration of what Percy Shelley called "the triumph of life." Still more problematically, positing the innate power of life calls into question one of Broglio's own chief claims: that a biopolitical analysis provides another way to debunk the concept of "the self" traditionally associated with romanticism (14, 113). In not just affirming life, but arguing that life affirms itself, Broglio reanimates a decidedly romantic vitalism, what Abrams calls "the celebration of that which lives, moves, and evolves by an internal energy, over whatever is lifeless, inert, and unchanging" (431). No doubt, Broglio's concept of life is a "materialist vitalism" or a "vital materialism"--as his multiple references to Gilles Deleuze and Maurizio Lazzarato attest. But insofar as life is construed as an originary presence that precedes power's address, it may perpetuate--as much as it interrupts--the expressivist logic of the self. Yet if Broglio is more beguiled by the self that he may care to admit, his achievement is still remarkable. Indeed, if I have belabored my concerns about the meaning of "life"--whether vitalist or deconstructive--it is because this book is in so many respects utterly compelling. Ambitious and innovative, Beasts of Burden crackles with intelligence, warmth, and insight. Whether or not it signs a death certificate for "the self," it opens up and models an exciting way to think about Romanticism, life, and their relation. On a personal note, it also reminds me why the study of Romanticism can sometimes matter. Alastair Hunt is Associate Professor of English at Portland State University. Leave a comment on Alastair Hunt's review.